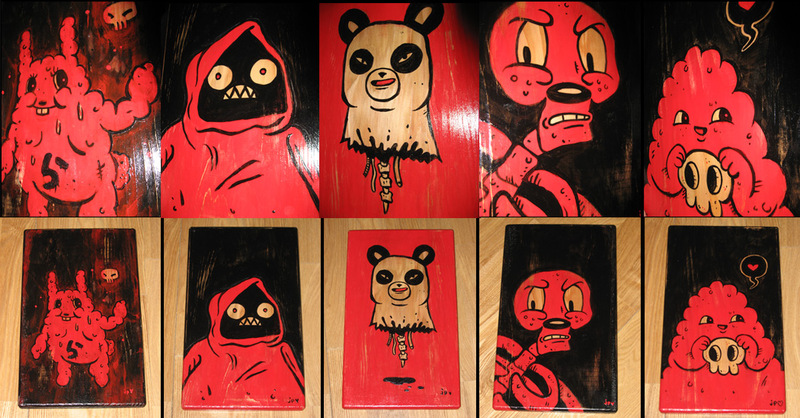 Paintings are red & black acrylic paint on high quality, hand routed fir wood planks and finished with a glossy protective coat. All paintings are 7.25 x 12 inches and just over a 3/4 of an inch thick. Ready to hang, all paintings come with a pre-drilled notch hole. Paintings sell on a first come / first serve basis. I will update the site when a piece is sold. Act quickly if you want a specific piece. Contact me with any questions or custom artwork inquiries. In case it's not available, you will be fully refunded. You may also list an alternative in your order. Sign up here to be notified when I add new artwork. if you don't see the add to cart buttons above.